Main entrance and stairs leading down to the chalets. We update Chalet Noella's details often, but facilities do change. e.g. some extras listed by the supplier as "free" or included might only be for the first time you use them, or for one time per party, then charged for further use. If any specific feature is essential to your holiday, make sure you ask us to confirm the details of it before you book your holiday. This package holiday to Chalet Noella in Val Thorens, France departs Sunday 5th January 2020, for a 7 night stay on a "catered chalet" board basis. A local tourist tax (Taxe de Sejour or Kurtaxe) is levied by many councils in European ski resorts. It varies by standard and type of accommodation and is age dependent, so not everyone is charged. It's not included in the basic price of your holiday and is usually paid locally. For reference, the average charged in winter 15/16 was between 50p and £2 per person, per night. Val Thorens lift pass price last reported as €208 (Adult 6 day). Ask for a quote when booking Chalet Noella. 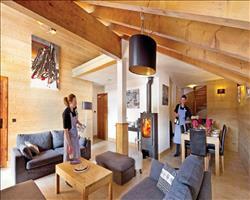 Chalet Chloe Val Thorens France, Stansted to Chambéry 5th January. 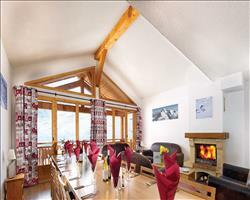 Chalet Catherine Val Thorens France, Stansted to Chambéry 5th January. 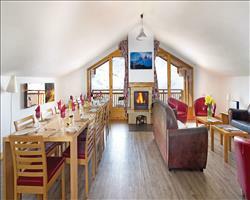 Chalet Olivier Val Thorens France, Stansted to Chambéry 5th January. "No problems at all, good all round"
I can’t think of any complaints to make about this chalet, we enjoyed all of it! The food was good, not the best we’ve ever had in our lives but definitely good enough for a chalet holiday. The hosts were really helpful. It’s a big chalet, with 3 different levels. We were a group of six and we more or less had our own level. It’s subdivided, but everyone comes in the same entrance. It wasn’t a problem for us, but one thing I do remember is that you have to take a flight of steps to get to and from the boot room, which some people might not be happy doing with their boots on. The chalet is almost in the middle of the resort and only a short walk to the piste that goes through the village. There was so much snow while we were here that you could ski from the chalet. The resort was great and although we try to ski a different resort each year, I would consider going there again. It’s purpose built, not chocolate box but you’re really high up so there’s lots of snow – we almost had a blizzard when we were there. I’d say this place was suitable for all ages. We preferred spending the evenings in the chalet but there are lots of bars close together and a lively nightlife so it would be great for younger people. Superb, intelligent and fun service from our staff. The accommodation was to a high standard and the food was excellent! "New and already popular, around 60 second from a blue run"
The property is located on the second floor, so it gives you the fastest access to the blue run literally a hundred yards away. It's a light and airy chalet and, because its only a few years old and in a great location next to the Balcons area entrance of Val Thorens, sometimes can get booked early (especially for peak dates like Christmas, New Year, February Half Term and Easter holidays). The resort centre in within a few minutes walks where you can take advantage of the great après ski Val Thorens has to offer, or just relax and get ready for another thrilling day in this enormous domain (over 600km of lift linked trails would you believe! ).